Former Assistant Commissioner of Taxation John Passant says that if we want a fair and equitable society, with no diminishment of services, we should be aiming for a more progressive tax system with less loopholes for big business and the wealthy to exploit. I AM a former Assistant Commissioner of Taxation in charge of international tax reform in the ATO. I retired in 2008. I am currently a casual tutor in the School of Humanities and Social Inquiry at the University of Wollongong. I will be talking later this month at the University of Wollongong about stopping the Government cuts and taxing the rich. Australia is a low tax and low spending OECD country. In fact just raising our tax level to the OECD average would raise in the abstract an extra $100 billion. The question is who to raise it from. My view is that the money is there to fund better public health, education, transport, social welfare, pensions and universities, and to take urgent action to address climate change (among other things). I will argue that the rich and capital are capable of paying much more in taxes to fund a fair and equitable society in Australia. To take one simple example. Paul Wellings is the Vice-Chancellor of the University of Wollongong. According to the Illawarra Daily Mercury, in 2012 his salary was more than $650,000. Let’s assume after 3 years it is now around $700,000. The top one and a bit percent of income earners earn more than $250,000. So why not tax any income greater than that at 100%? Paul Wellings would be contributing $450,000 in tax on the $450,000 above $250,000 he earns. Sound far-fetched? Left wing French presidential candidate Jean-Luc Melenchon argued for the same sort of tax. He won 11% of the vote (down from earlier polls showing up to 17%) and forced the Socialist Party’s ultimately successful candidate to adopt a watered down version. And as I have written before, we could argue for a wealth tax, abolition of all tax expenditures for the rich (think superannuation tax concessions) and capital. We could abolish tax concessions for the rich and capital and tax all super profits (think banks as well as mining companies during the mining boom). We could make the income tax system more progressive. We could, as Treasurer Joe Hockey suggested in 2011, in Opposition, before quickly retreating — tax trusts as companies. Eighty per cent of capital gains are earned by the top 20%. We could abolish the 50% capital gains tax concession. We could abolish Income Tax Assessment Act sections 25-90 which, contrary to all tax principles, gives big business a deduction in certain circumstances against exempt income. There’s $600 million a year. 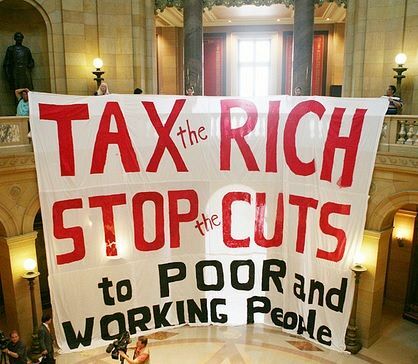 We could tax the capital gains on the houses of the rich. I have done a few back of the envelope calculations just to show the money is there in the hands of the rich to address the chronic under-spending on public health, education, transport, social services and addressing climate change. Since only just over 1% earn income greater than $250,000 such a tax would raise some revenue. It would also send a signal to the rich and capital and to workers and the poor that the days of the rich bludging off the tax system are over. I don’t have a Treasury area to do the sums and analyse the impacts for me, so let’s make a few assumptions. Assume there are ten million individual taxpayers. One per cent of that is 100,000. Assume the average income of this top 1% of income earners is $450,000 (skewed by the super rich to that figure.) That means we could raise in revenue about $200 billion. To explain, $450,000 less $250,000 is $200,000 all of which is taxed under my proposal at 100%. If there are 100,000 from whom we are on average raising this $200,000 in tax then that gives us $200,000 times 100,000, which is $200,000,000,000 ($200 billion). Of course, my assumptions could be way off and the average income of the top 1% of income earners might, for example, only be $300,000, in which case the tax figure would be $50 billion. And maybe there are not 100,000 individuals who earn more than $250,000 taxable income. Perhaps many of them would set up discretionary trusts to divert their income into lower-taxed hands, or the old bogey, flee overseas. Even if the figure is only 50,000, we’d still be talking about $25 billion. Even if companies responded by only paying their top executives $250,000 and pocketing the difference, I would argue: instead of that going into dividends or reinvestment it should be paid to their ordinary workers in higher wages. That would of course require a fight from workers and their unions to achieve that. The top 20% of wealth holders own about 45% of all the wealth in Australia. That wealth totals about $6.3 trillion, so the top 20% own about $3 trillion of Australia’s wealth. A 1% annual wealth tax on that wealth would yield, according to my back of the envelope calculations, about $30 billion a year. We could, of course, skew the wealth tax to the top 10%, or even 1%, since the wealth they hold is proportionately much higher and then, in recompense for the amounts lost from those rich – but not super rich – wealth holders, increase the wealth tax rate on them. I’d welcome comments from readers about making these figures more rigorous. Given the effective tax rate (tax as a percentage of accounting income rather than taxable income) on the top companies is about 19%, and one third of the top 200 ASX listed companies pay an effective rate less than 10%, maybe the time has come for a minimum company tax, essentially a tax on accounting income rather than taxable income for low tax paying companies. We could also charge the likes of Google, Apple, and so on, a fee for operating in Australia — perhaps set at say 30% of turnover here. In Google’s case, that would be a fee of about $600 million, (30% of the $2 billion in revenue its Singapore hub gets from Australia) just a little bit more than the $740,000 in tax it paid on that Australian sourced income a few years ago. We could do the same with Apple, whose tax arrangements, according to tax academic Anthony Ting in the Australian Financial Review, have seen it shift about $28 billion in income untaxed so far from Australia over the last decade. However, tax is a second order mechanism for addressing increasing inequality. I argue that the shift in wealth from labour and the poor to capital and the rich over the last three decades in Australia (echoing trends globally) can only be addressed ultimately at the point of production — through higher real wages, defence of jobs, and a 30 hour week without loss of pay, along with other measures. You can hear John Passant discuss at a forum being held at 12.30 pm on Thursday 23 April in room 19.2040 at the University of Wollongong. This story was originally published on John's blog enpassant.com.au and has been republished with permission.